A stunning visual and narrative homage—featuring more than 100 black & white and color photographs, many never before seen—that captures the wonder and metaphysical power of Burning Man past present, and future, and the magic that draws us to it, by the ultimate Burning Man insider. Growing up in 1950s Oregon, brothers Stewart and Larry Harvey rebelled against their small-town culture and the conformist norms of Eisenhower’s America. Stewart turned to photography. Larry, drawn by the siren call of the burgeoning counter-cultural movement, fled to San Francisco, where he met a group of alternative artists like himself. During his frequent visits south, Stewart, camera always in hand, photographed the intimate creative worlds of Larry and his friends—images that would chronicle the birth of one of the most important cultural, artistic, and social movements of the twentieth century: Burning Man. 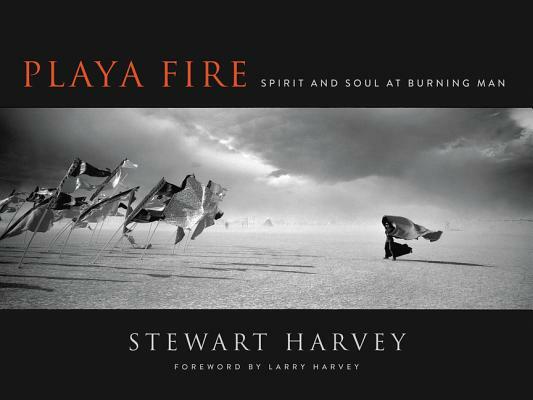 Filled with the rare insights of Stewart’s decades-long friendships with his brother and the five other founders, as well as the many people who have shaped it, Playa Fire is a Burning Man story like no other. An artist and writer of striking emotional depth, Stewart marries stunning photos reflecting the beauty and grandeur of the desert landscape and the ephemeral, hallucinatory beauty of Black Rock City with a compelling narrative journey that captures the landmark festival’s spiritual essence. Drawn from his personal archives and taken over thirty years at Burning Man—many at "First Camp"—his panoramic photographs are accompanied by never-before-seen memorabilia, including Larry’s original sketch of the first Man as well as family photos of the young Harvey brothers and their band of merrymakers. An exquisite work of art that embodies the radical imagination at the core of this transformative event, Playa Fire celebrates both the spectacle and the meditative that is Burning Man. It is an enchanting portrait for die-hard "Burners," arts enthusiasts, and the intellectually curious fascinated by this iconoclastic, beloved cultural phenomenon.